IELTS Essay no.1: Only pupils of similar interests should be given admissions in schools. IELTS Essay no.2: Some authors believe that urbanisation is a ‘Modern Disease’. IELTS Essay no.5: What changes would you implement in this 21st century? IELTS Essay no.6: Should poor countries continue to receive International Aids? IELTS Essay no.8 :Can internet world replace the world of books and words? IELTS Essay no.10: Are famous people treated unfairly by the media ? IELTS Essay no.11: What should the government in your country do to solve the problems? IELTS Essay no.12: Life was simpler without so much of technology. IELTS Essay no.13: The 21st century has begun. What changes do you think this new century will bring? IELTS Essay no.15: Borrowing money from another country may damage relations. IELTS Essay no.17: Women are always better parents than men. How far you agree with this? Who take the IELTS Exam? 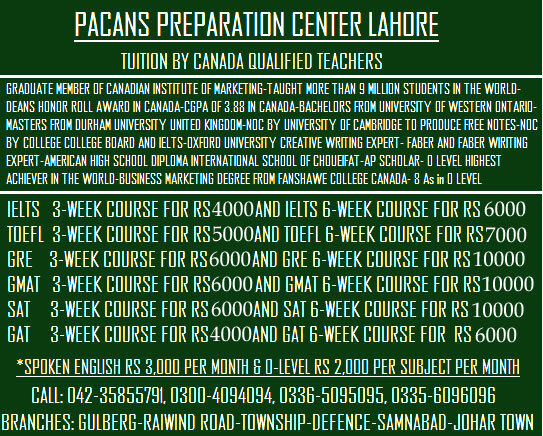 Where should I prepare for my IELTS exam in Lahore? What is the best way to do practice for the IELTS reading section in Pakistan? Who is the best teacher for IELTS exam in Lahore? Basic Math Lecture 2: What is a product? Copyright © 2015 Pacans Online, All Rights Reserved.